TMP bids farewell and thanks to outgoing AGM(Admin/Finance) Haji Latiff Coupon after four & a half years with TMP. 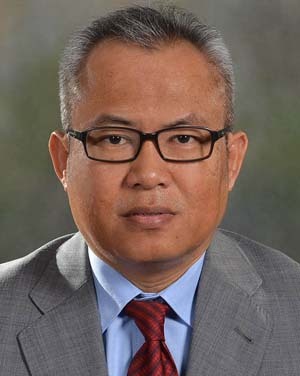 As one of the principal officers instrumental in the initial set-up of TMP in 2009, Haji Latiff, who hailed from Dalat and who holds a degree in Computer Science and a Chartered Member of Institute of Logistics & Transport (CMILT) UK, leaves TMP to take up his new posting as General Manager of the newly established Tanjung Manis Port Authority with effect from 1st January, 2014. His leaving is greatly felt by all at TMP but we are happy for him in his career advancement and wish him all the best in his new appointment. The contribution of Haji Latiff from the formative years of TMP in the transformation of the "largely underutilised port “ to what it has become today, a successful port operator and the legacy left behind will spur us to work harder to make TMP a port to be reckoned with. And these would not have been possible without the unflinching support of the State Government, STIDC, our hardworking Chairman Datu Haji Sarudu Bin Hj. Hoklai and Director Tuan Haji Hashim Bojet, our Board of Directors, the tireless and unrelenting efforts of Executive Director Puan Sadiah Tu and we at TMP are blessed to have such dedicated people to guide the company.